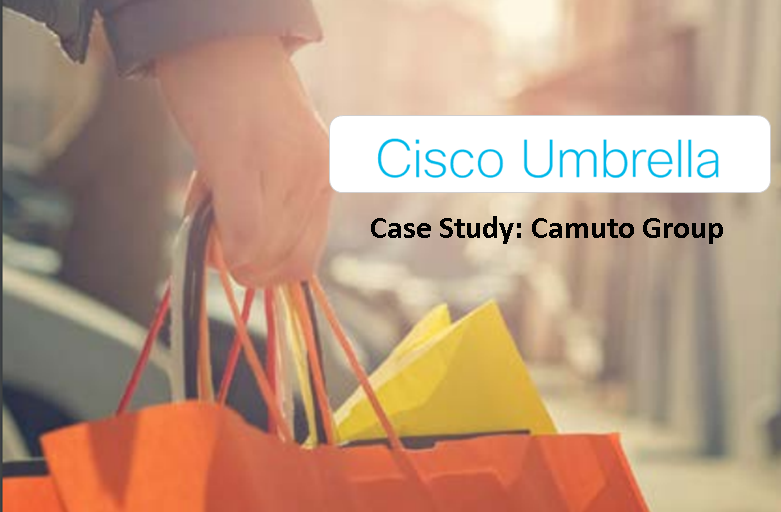 Cisco Umbrella: Camuto Group Case Study – CT Link Systems, Inc.
A US footwear and lifestyle brand company, the Camuto Group, has been thriving in their industry due to the unique designs that sets them apart from the competition. However, the company’s creativity is also one of its IT’s main pain points when it comes to security. With almost 100 employees working remotely and another 250 roaming laptop users, it makes it difficult for IT to allow the flexibility to access the wide range of edgy sites which many web filtering solutions block incorrectly. Tom Olejniczak, Camuto Group’s network engineering manager says that they found the traditional approach to securing the web experience (Proxy servers) caused too many problems that needed manual resolution. Meaning whenever someone could not access a site, someone from IT had to go to that user to help resolve the issue, which was not feasible for them given the multiple remote and roaming users. They needed to find a network security solution that protected on and off-network devices which didn’t add to their latency that could help them as malware and social media started to cut into the productivity of the users. Tom says that the company has been following Umbrella as their first line of defense since it was still OpenDNS. However, to test if there were better alternatives, they decided to try two similar products to Umbrella. The result of the test was that Umbrella outperformed both products whether it was by malware protection and overall user experience. This was achieved by deploying Umbrella’s virtual appliances. This gave them the visibility to see if internal networks or Active Directory users were infected or targeted by attacks without the need to touch devices or reauthenticate users. Users working out of the corporate network are protected via Umbrella’s roaming client which was simple to put in place as adding someone to a group in Microsoft Active Directory. The Camuto Group saw immediate impact on the security, almost four hundred detections of malware were redirected on a daily basis. The solution itself also was great for user experience as it is unobtrusive and even helped improve the speed of the internet slightly, about five to ten percent. The ability to white and black list sites was one of the main concerns of the company that Umbrella helped solve quite easily. Tom says that they are able to choose safe and HR-acceptable categories for content filtering fast, it would usually take them about 3 minutes make a change. To learn more about the Cisco, you may check out our product page here or you can contact us directly at 893-9515 for more details!